The objective of the data is to enable schools, education authorities, and governments to better understand the needs of students with disability and how they can be best supported at school. But the type of information currently collected varies between each state and territory and across government, Catholic and independent school sectors. Part C Reference material presents links to key resources that schools should refer to during the process of moderation to improve the consistency and reliability of their data. This may be used to inform policy decisions about how to best support students with disability. The interim disability loading has been extended to 2016 prior to the development of the permanent loading. The information collected by schools will be available to all governments to inform policy and program improvement for students with disability. This notice is available on the department's at If you have any questions about the data collection please do not hesitate to contact: Kerry Spicer-Worth, Head Teacher Welfare. This information will inform policy development and planning to support schools in implementing quality learning and support practices. Through this process, data are collected about students across Australia who receive an adjustment to participate in education because of disability. This may be used to inform decisions about how to best support students with disability. Each Approved Authority decides how and when their schools will provide data to the collection and advises their schools accordingly. The information is provided to the Commonwealth as a series of number sets that cannot be used to identify any individual student or school. Reasonable adjustments can be made across the whole school setting e. An e-learning resource about the Disability Standards for Education 2005 is freely available for the use of individuals, families and communities at. Personal details, such as student names or other identifying information, are not provided to local or federal education authorities. This information will inform policy development and planning to support schools in implementing quality learning and support practices. What information will be collected? This is now an annual data collection. This information will help teachers, principals, education authorities and families to better support students with disability to take part in school on the same basis as other students. What is the benefit for my child? A professional learning website, developed by , helps principals, teachers and other school staff better support students with disability, and to understand and implement the. Resources for schools Resources for parents, guardians and carers Fact sheet. The Standards can be accessed via the ComLaw website at. View the videos for more information on the Department's whole school approach to support student learning. This may be used to inform policy decisions about how to best support students with disability. This collection relies on the professional judgement of principals, teachers and other school staff about the level of reasonable adjustments provided to students with disability to access and participate in education on the same basis as other students, as well as their broad category of disability. This information will help teachers, principals, education authorities and families to better support students with disability to take part in school on the same basis as other students. What is the benefit for my child? Through this process, data are collected about students across Australia who receive an adjustment to participate in education because of disability. 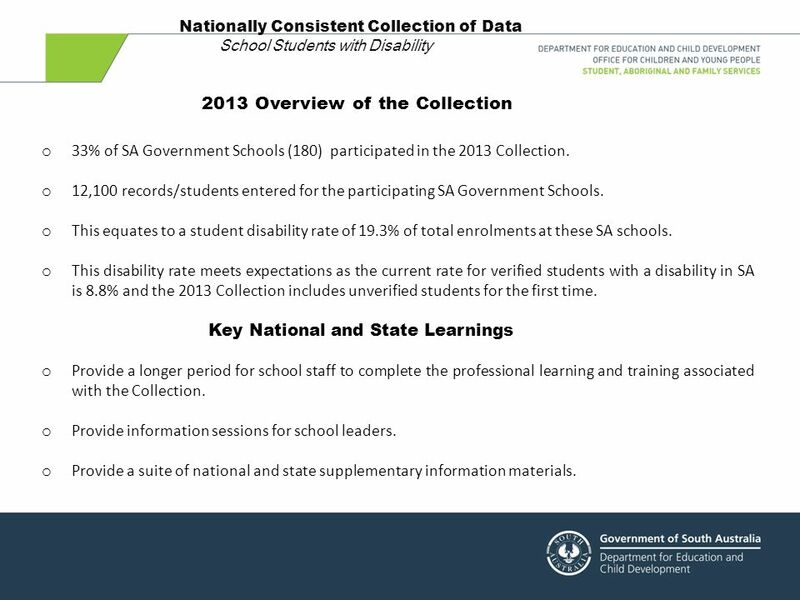 The Nationally Consistent Collection of Data on School Students with Disability the national data collection is an annual collection that counts the number of school students receiving an adjustment due to disability and the level of reasonable adjustment they are receiving. It counts the number of students who are supported under these obligations based on the professional judgement of teachers and their understanding and knowledge of their students. It will also take some time to see the downstream effects of the adjustment funding, as each school implements their own supports, resources and programs. Nationally Consistent Collection of Data on Students with Disability All governments have agreed to undertake annual data collection on students with disability. This collection relies on the professional judgement of principals, teachers and other school staff about the level of reasonable adjustments provided to students with disability to access and participate in education on the same basis as other students, as well as their broad category of disability. Each school provides school level data about the number of students with disability at their school, in Foundation Year 1 minus 1 through to Year 12, and their level of education adjustment as at the first Friday in August 04 August 2017. Schools are required to make reasonable adjustments, where needed, to assist students with disability to access and participate in education free from discrimination and on the same basis as other students. Nationally consistent information on students in Australian schools receiving adjustments for disability enables schools, education authorities, and governments to better understand the needs of students with disability and how they can be best supported at school. The data technical specification for the collection is also available in the links to the right of this screen. The Nationally Consistent Collection of Data on School Students with Disability the national data collection is a joint initiative of all Australian governments and all state and territory government and non-government education authorities. Further information Fact sheets for schools, parents and carers are available on the website. There are four key elements that teachers and school staff address in delivering personalised learning and support over the course of the school year. A series of video case study illustrations of practice is also available on this site. All students are entitled to a quality learning experience at school. Process and help for schools Advice and assistance A help desk for the national data collection located in the state office is available to schools. Part C Reference material presents links to key resources that schools should refer to during the process of moderation to improve the consistency and reliability of their data. This improved information will help education authorities and schools better target programs and resourcing decisions, contributing to more effective outcomes and a quality learning experience for all young Australians. Key activities and timeframes Supporting students with disability The national data collection captures the work of schools in the provision of for students with disability. Part A Understanding moderation and key principles offers a general overview of moderation, suggested membership of the moderation team, and advice on the best time to moderate. No personal identifying details of students are collected. The result is a built-in proforma to the exact specifications and format required by the government. Hits: 6488 Information for parents and carers What is the national data collection? Therefore, a government school in suburban Sydney collects and submits data in the same way as a Catholic school in country Victoria and an independent school in the Northern Territory. Naturally, it will take time to embed understanding of the collection model across all Australian schools and ensure accuracy and consistency. For the purposes of the national data collection, students with learning difficulties, such as dyslexia or auditory processing disorder, as well as chronic health conditions like epilepsy or diabetes, that require monitoring and the provision of adjustments by the school, may be included. This collection relies on the professional judgement of principals, teachers and other school staff about the level of reasonable adjustments provided to students with disability to access and participate in education on the same basis as other students, as well as their broad category of disability. Through this process, data are collected about students across Australia who receive an adjustment to participate in education because of disability. The department continues to work with the Australian Government Department of Education and all other state and territory education authorities regarding the implementation of this national initiative. It will also take some time to see the downstream effects of the adjustment funding, as each school implements their own supports, resources and programs. Naturally, it will take time to embed understanding of the collection model across all Australian schools and ensure accuracy and consistency. At Edumate, we spend a lot of time talking to schools about the challenges of administration, learning, and curriculum management in order to hone in on design features that will really make a difference to the way schools operate.